Dr. Ho's Decompression Belt Reviews - Is it a Scam or Legit? In just 30 minutes per session, Dr. Ho’s Decompression Belt claims to provide in-home relief from chronic, acute back pain using gentle and effective traction, but does it work? If you recently saw an advertisement or watched an infomercial for Dr. Ho’s Decompression Belt, you’re probably wondering if the traction it provides really can help treat your chronic, acute back pain. And if so, does Dr. Ho’s Decompression Belt really make the process as easy as it claims? To put the claims of Dr. Ho’s Compression Belt to the test, and to find out if it’s worth your hard-earned money, we did some in-depth research, and here’s what we found out. Dr. Ho’s Decompression Belt, also known as the HoPhysio Belt, is a 2-in-1 decompression belt that claims to provide gentle clinical-grade traction and decompression therapy (hence the “2-in-1” designation), which is claimed to provide relief from chronic, acute back pain resulting from degenerative, herniated, or bulging discs. In fact, the product’s website claims that this technology has been endorsed by medical professionals for use on patients with upper and lower back pain, which is something we’ll discuss more in the Bottom Line section. After placing Dr. Ho’s Decompression Belt around your waist, you’ll then need to attach the pump and inflate. Once this occurs, the product’s website claims that the belt will expand vertically, which tractions your lower back while decompressing spinal discs and relaxing the muscles surrounding them. As such, Dr. Ho’s Decompression Belt claims to help you reduce your visits to the doctor, as well as to avoid surgery and overdependence on pain medications. For the first week, Dr. Ho’s Decompression Belt should be used 3-4 times per day, for 20-30 minutes each session, which can be increased if necessary thereafter. The product’s website claims that it can also be worn under your clothes, which is claimed to allow it to relieve pain wherever you are (including in bed), while also giving you the ability to be more active. Dr. Ho’s Compression Belt is claimed to be safe for use by anyone, regardless of age or size, although you should always consult with your physician beforehand. Dr. Ho’s Compression Belt is priced at $179.96, and while it appears that standard shipping is free, this couldn’t be confirmed since a total isn’t provided on the checkout page. However, rush shipping will cost you an additional $34.99. Deluxe Package: $209.94 – Includes DR-HO'S Neck Comforter, Spinal Secrets DVD, and "Relief" Book by Dr. Michael Ho. Ultimate Package: $304.94 – Includes everything found in the Deluxe Package, in addition to DR-HO'S Neck & Shoulder Shiatsu Massager, and Bonus Car Adapter for Shiatsu Massager. Dr. Ho’s Decompression Belt comes with a 30-day money back guarantee, less S&H charges, as well as a 90-day warranty. In order to initiate the refund process or to file a warranty claim, you’ll need to contact customer service at 877-374-6669. Keep in mind that during our research, we also found Dr. Ho’s Decompression Belt for sale on Amazon.com, Newegg.com, and several other online retailers for as little as $95. What Do Other Consumers Have to Say About Dr. Ho's Decompression Belt? Overall, it appears that Dr. Ho’s Decompression Belt has mixed online reviews, which tend to lean toward the negative side. Some of the most common complaints we encountered included that it is bulky, uncomfortable, and hot (see more about this in the Bottom Line section), and that it doesn’t provide results. Specifically, many customers stated that if the belt did provide any results, pain reappeared soon after taking it off. In fact, many of these same customers stated that it doesn’t provide any more support or pain-relief than elastic belts, which are much less expensive. It should also be noted that learning the truth about other customers’ experiences with Dr. Ho’s Decompression Belt can be a time-consuming process, since you’ll encounter numerous affiliate websites during your research. What’s the Bottom Line About Dr. Ho's Decompression Belt? First, decompression for back pain, whether applied at home or in a doctor’s office, has not been conclusively shown to work. This is because, as with any other treatment, the relief it provides is highly dependent on a number of factors, including what’s causing your back pain, where the injury occurred, how long you’ve had the injury, etc. To support this, according to this article, “the benefit of [spinal decompression] treatments is not established.” However, the British Medical Journal took it one step further in 2004 when they published that, “Routine physiotherapy seemed to be no more effective than one session of assessment and advice from a physiotherapist.” As you can see, while the Dr. Ho’s Decompression Belt website claims that its technology is endorsed by medical professionals, this doesn’t mean that it’s been proven to work, and you may not experience any pain relief from using it. Finally, keep in mind that, according to the product’s FAQ, it must be worn over a layer of light clothing. This means that if you venture out into public with it on, you’ll likely want to wear another piece of clothing to conceal it, which could be problematic during the hotter months of the year. The FAQ also notes that you’ll receive faster and more pronounced results if you wear the belt while laying down, which means that if you’re expecting to receive good results while going about your day, you may be disappointed. Bottom line: If you’re desperate for non-surgical, non-drug relief from your lower back pain, Dr. Ho’s Decompression Belt may provide you with relief. However, based on the numerous negative customer reviews we read, it’s really a flip of the coin as to whether or not it will effectively work. Instead, you might first try a much less expensive elastic belt and go from there. I purchase one of Dr. Ho Belt and I also received one as a gift, so I decided that I didn't need two. So I decided to send the belt back that I purchase because it was never used and I have been given the runaround. I have left messages with the customer service voicemail because their phone message states to leave a message and they will get with me. No one has ever called me back. They advertise that if you are not satisfied with their product you can get and receive a refund when you return the belt. Well, my 90 days are up for a refund and no one is helping me. I wish that I never purchased this belt because it has been nothing but a headache. Hi Natasha, I'm sorry to hear you had issues getting in touch with our company. Our customer care team can be reached at 1-877-374-6669. I looked up your file and see that it has been noted that you are returning your belt for a refund. I'm glad to see that we finally connected and that you are able to return your belt. This belt actually made my back worse. Wore it one day for 10 hours driving and I have new pains I didn't have before. Feels like I pulled my back out all over again. I suppose it's possible that I overinflated it, but isn't that supposed to be the way it is? Hi Craig, we would be happy to speak with you to help troubleshoot how to best use the belt for your back pain. We do not recommend wearing it inflated for more than 1 hour. In addition, we could assist with the best option for inflation for you. Please reach out at 1-877-374-6669. I WOULD NOT recommend this device! I had one of these after my operations, lack of a better word, it’s a joke! It does not work like they claim, very uncomfortable. It leaks down, and did I mention VERY UNCOMFORTABLE? Hi Kev, we are sorry to hear you had issues with your belt. Decompression technology is meant to help stretch and support your back. In our instructions, we suggest only wearing it inflated for no more than an hour. The rest of the time it can be worn as a regular support belt. If you need help troubleshooting how to use the belt, please contact our Customer Care team at 1-877-374-6669. Really Dr. Ho? Best technology you can come up with is a pump? Did you steal that idea from your kid's bicycle? So anyone who has arthritis in the hand, wrist or arm joint pains, cannot use your product, which in turn is the majority of the older population...40+ and up! If that's your best idea for a back pain reliever belt, then you're no real doctor. Get back to the drawing board, and put a bit more thought into the technology into your product. BTW, your products are way overpriced. Which could only mean you're a greedy scammer. Hello Lady Love. Decompression technology has been used by professionals for many years to help with back issues. Many people who suffer from arthritis in joints like the wrist or hands prefer to use our Pain Therapy Systems. The combination of TENS and EMS help to reduce swelling and alleviate pain and tension. As a long-time sufferer of osteoarthritic pain, I have tried a lot of things to relieve the pain. I have tried pain-relieving drugs. They DO work, but there are side-effects. I have tried regular chiropractic care, and that helps A LOT. Then I found Dr. Ho's 2-in-1 Back Relief Belt. WOW! I felt a little relief after the first time I inflated the belt, by my experience is after I got used to it, it worked better and better each time. I supplement my use of the belt with regular chiropractic care. I have been diagnosed with severe degenerative osteoarthritis, so Medicare now covers most of what I try for pain relief. My chiropractor accepts Medicare Assignment, accepting what Medicare pays him as full payment. Medicare paid the cost of this belt, so there was NOTHING out of pocket. I found the claims about this belt to be ABSOLUTELY TRUE. My results were NOT miraculous, but after the 3rd and the 4th and the 5th treatment using the belt, I have less trouble getting around. I know the results are not imagined, because my chiropractor has noticed an improvement. Like he said, I had nothing to lose by TRYING the belt. So I tried it, and now my chiropractic adjustments take less than 20 minutes! Hi Tommy, we are happy to hear that you are getting the relief you need to help you get around! I received a belt and hand braces in early February the pump for the belt has stopped working so I wanted to know if I could order a new pump? I was skeptical, but when you are in tears and falling due to a lower back condition, what the heck. The belt has helped me tremendously. I am 71 years old, and have a couple of part-time jobs that I am confident I can now do. You have to do it daily and do some of the exercises too, but it works for me. Thank you Lawrence! We are glad that we have given the ability to do those jobs now! I honestly don’t know if this product works, because when I bought it, it was too big for me that I had to put it aside after using it for a day, even though when I called customer service they said it should still work. At that time I was suffering from Sciatica and I thought this would help me, but I had to seek other treatment. Recently (2/25/2019) I started having the pain again and I tried the belt for two days, and on the second day, while wearing it I heard a pop sound and the belt was deflated. I purchase this belt on the 29th of September, 2017 and only wore it for three days and it seems like I had wasted my $200.00. I called customer service for help and they said they could not help me because it was over twelve months and if I need another belt I would have to purchase it. My problem is with the quality of the product, I didn’t have time to know if it works, I just wanted some support for my back and as I said I only wore it for THREE DAYS. Please do as much research as you can before buying this product, because it could be very costly. After calling them and getting set up, I received a call from Victor yesterday (2/8) stating my doctor did not give the ok for the belt. This is 5 weeks after I did all the paperwork with them. I called my doctor's office the day they told me to do so telling them to look out for a fax for my doctor to approve. Once again this was 5 weeks ago, and they said no problem, so why Dr. Ho’s office waited so long to get back to me is unknown. There is no way my family doctor would have turned the belt request down without calling me first. All I can say is the service is not very good. I was okayed by Dr. Ho’s office that my health insurance would cover the belt purchase early January. Our 2-in-1 Back Relief Belt is a Medicare covered product. Since DR-HO'S is not set up to bill Medicare plans,we would refer you to an insurance specialist of an affiliated brace company that can work with you to get coverage for the belt. To reach the insurance specialists about all Medicare coverage inquiries, please call 1-855-483-6964. The very first time I used the belt I wore it upside down (the inflation tube positioned on the bottom of the belt on my right). IT HURT! I had to remove it within 2-3 minutes. The next day, I decided to try it again. I actually read the directions and positioned it correctly (with the inflation tube positioned on the top of the belt, my left side). It worked great while I was wearing it but as soon as I took it off the pain returned immediately. Obviously not able to wear it 24/7, but when it is used and used correctly it works! Thanks Melody! We are glad to hear that it works when you wear it. Over time I hope your pain is reduced! Best yet, and I have tried a lot of things for my back. I injured my lower back in 1990, tried chiropractic, pain medication therapy. Since receiving my belt, I am pain-free. Thanks for making this great product. Thank you Olivia - we are so happy to hear that you are pain-free! I called three times. The first time I gave all my information to the woman and she'd put it in the computer. The second time was to check on the status, and the supervisor said that they had none of my information at all and asked if I called the same number as before. The last time I called was within the hour, and when the woman answered, I asked to speak to the supervisor because I wasn't going to go through what I had before. After a short hold some woman came on the phone claiming to be the supervisor and asked how I was getting the belt, (insurance, cash or Medicare), I told her that she sounded like the woman that answered the phone and that I'd call back later. Horrible customer service unless you talk to a real supervisor. 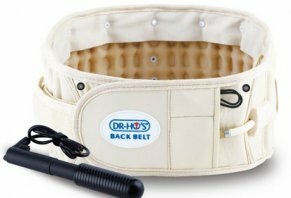 Write a Review for Dr. Ho's Decompression Belt!